Construction is now officially underway on the new Rutgers School of Business, designed by the renowned architecture studio Ten Arquitectos (frequently covered by arcspace), but you don’t have to wait until construction is complete to explore the new design! 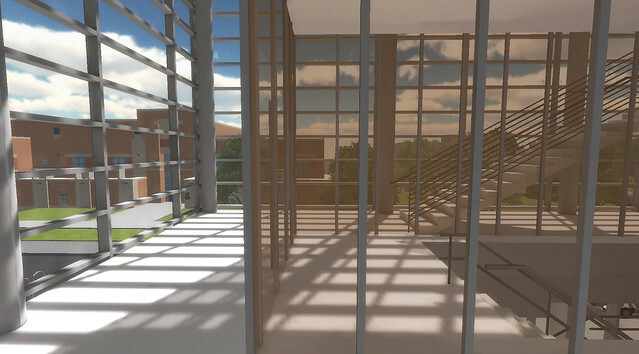 Arch Virtual recently completed a virtual prototype of the new facility for Rutgers University, replicating the design based on architectural CAD drawings, BIM models and blueprints provided by the architect, then publishing them into realtime 3D with the Unity3D game engine. 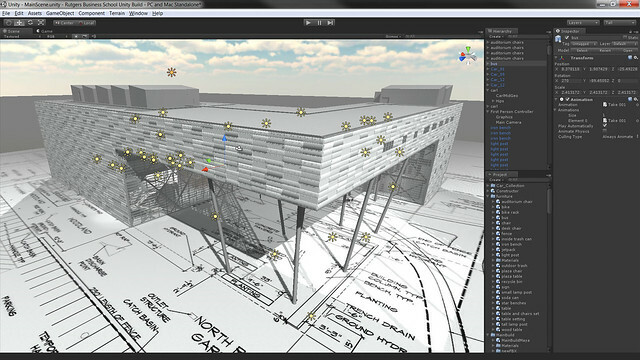 See a video preview of the virtual model below, and see some screenshots of the model here. Read the rest of this post on our new site HERE. Rutgers University leveraged the best of several virtual platforms throughout design development of this project. 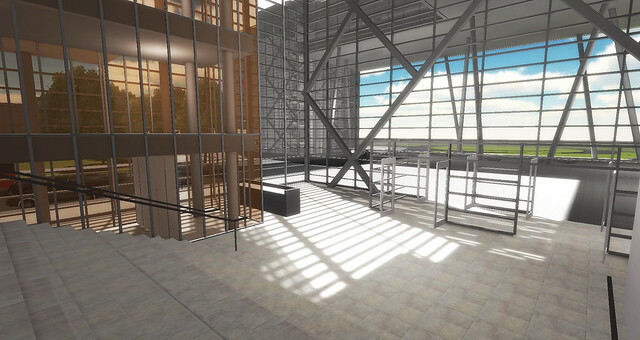 In early design phases, Arch Virtual replicated the design in Second Life, which was ideal for recreating the schematic and conceptual models and making the design accessible to students and faculty (seen here). 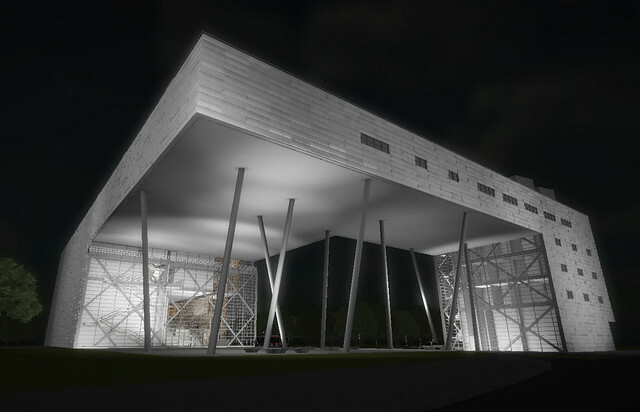 That model was then brought into OpenSim, where it was integrated into a more comprehensive model of the campus, including more of the context surrounding the Business School’s new building site. 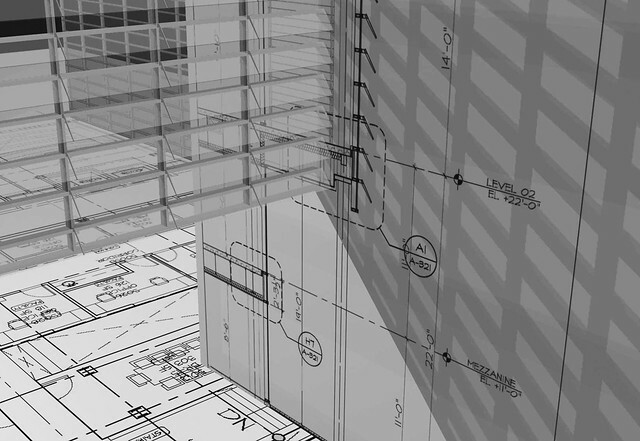 When final construction documents were ready, we interpreted the architect’s CAD drawings and BIM model with Autodesk Maya, that could be brought into the Unity3D game development engine. Rutgers worked with Tipodean Technologies to export their OpenSim islands, including buildings surrounding the new business school. Tipodean converted them into Collada mesh format, along with the textures, which were then added to the Unity3D environment. 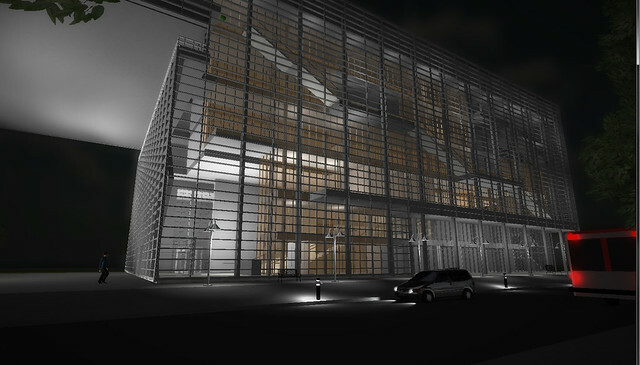 The final result is a blend of the architectural model alongside meshes exported from OpenSim. With the model in Unity, Rutgers will now be able to embed the virtual model into a variety of formats. For example, they can embed the model directly a website or Facebook page, but could also publish the same model to be accessible from Android or iPad mobile devices, or as stand-alone applications that can be installed on a Mac or PC and run locally without being online, and at full screen.